COURBEVOIE, France-(BUSINESS WIRE)- IDEMIA, de wereldleider in Augmented Identity, is verheugd om een Urban Mobility oplossing aan te bieden op basis van haar alliantie met SIBS en Otlis, het consortium van 7 vervoerders dat de interoperabiliteit in Lissabon en het gemeenschappelijke systeem van 27 mobiliteitsbedrijven beheert. COURBEVOIE, France–(BUSINESS WIRE)– IDEMIA, the global leader in Augmented Identity, is excited to offer an Urban Mobility solution on the back of its alliance with SIBS and Otlis, the consortium of 7 transport operators that manages the interoperability in Lisbon and the common system shared by 27 mobility operators. In an increasingly connected world, electronic solutions are popping up everywhere and dual interface payment cards are now common in people’s wallets even if they are put to just one use – namely payments. Meanwhile IDEMIA has developed a new payment card called Cosmo Fly that comes with new services including Urban Mobility, enabling cardholders to buy public transport tickets directly from their bank’s transport partner. The tickets are stored in their payment card and can be used immediately. 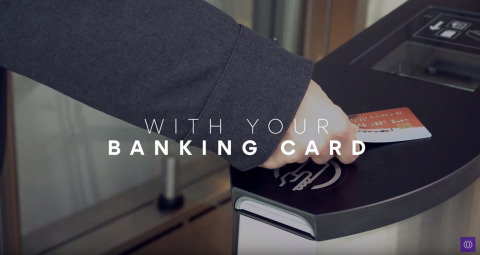 This solution is very convenient for commuters as they pay and travel using just one card. While open-loop systems require connected EMV gates and bank administrative support, Cosmo Fly cards behave just like standard e-tickets. What’s more, being CNA certified means that the card is fully compatible with existing transport networks… Give your passengers a faster, easier, more convenient experience! CNA is a non-profit association whose objective is to promote, define and manage specifications and certification of the contactless ticketing technology Calypso, which is embedded in 20% of the contactless transportation cards in the world. Its board is administered by the SNCF-France, RATP-Ile de France, STIB-Brussels, ACTV-Venice, OTLIS-Lisbon, CTS-Strasbourg, Interparking-Belgium, GIE CB-France, 5T-Torino, Riga’s Karte-Riga and the Landkreis of Konstanz and counts more than 100 members.